Comfort Keyboard Systems has created a new sort of "hotkey" - one that is not a key... but a pedal that can be used by your left or right foot. Up to three foot pedals may be used on select Comfort Keyboard System ergonomic keyboards, and with the intuitive key-mapping and programming software interface commands, any key or macro command may be triggered via a pedal click! reach key, or used as a macro. These Pedals can be programmed to be any key on the keyboard, it can also emulate mouse clicks. 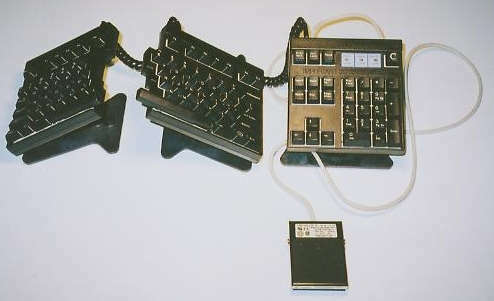 - Foot Pedals works with any keyboard and any mouse on the market. - Foot Pedals fully programmable without any software. - Foot Pedals can be Programmed and re-programmed while unit is connected. - Foot Pedals can emulate ALL mouse functions. - Foot Pedals can be the function keys on the keyboard " F1, F2, F3.....F12, Ctrl Key, Shift Key, Alt Key. .
- Rest your feet on the Foot Pedals, click when you are ready. - Connect into Comfort Keyboard. - FootPedal can hold a Macro. 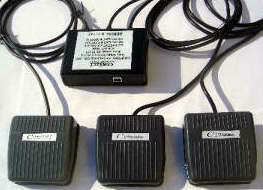 - Foot Pedal fully programmable without any software. - Foot Pedal can be Programmed and re-programmed while unit is connected.